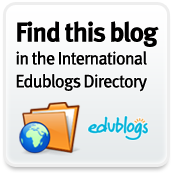 One of the best ways to discover some great educational blogs is to visit the Edublog Awards. After weeks of nominating voting is now open. You can vote for blogs, tweets, wikis, social networks, audio and video categories. There are 23 categories that you can vote for. You can see my nominations here. The Pursuit of Technology Integration Happiness has been nominated in two categories and I am completely humbled to be included with these other great bloggers and educators. 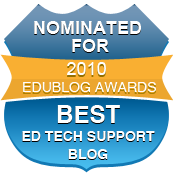 You can vote for The Pursuit of Technology Integration Happiness for the Best Resource Sharing Blog and Best Educational Technology Support Blog. Check out all the other great categories and case a vote! Thanks for your vote!